As anyone who has followed horse racing for any length of time knows perfectly well that there is no such thing as a certainty in this highly unpredictable and thrilling sport. But at this stage there will be very few people who bet on racing prepared to go against the majestic Sprinter Sacre after the champion-elect put up another awesome performance at Cheltenham recently to strengthen his stranglehold on the ante-post market for the Queen Mother Champion Chase, the March 13 showcase event having appeared to a great degree to have been conceded by many in the sport to him with fully six weeks to go before the big race itself. 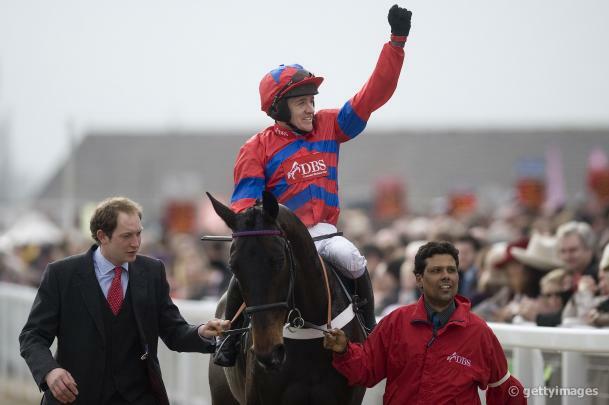 Of course there is no certainty that Sprinter Sacre will even make the starting line-up as even the best of athletes are vulnerable to last-minute hitches and unexpected injuries. If he arrives at the Festival though in top order it is hard to see anything getting within shouting distance of the horse that a growing number of seasoned observers suggest could be the best at the distance in more than a generation. The current top-priced 2/5 ante-post favourite in the Cheltenham betting odds glided around Prestbury Park on January 26 as if he was out for morning exercise, Nicky Henderson’s imposing seven-year-old oozing class as he tracked the leaders before coasting through to take up the running before the seventh fence. From then on it was very much a case of who would be second – for the record, Mad Moose achieved the feat some 14 lengths behind the winner – as Barry Geraghty’s mount drew clear from the third last to win the Grade 1 Victor Chandler Chase in simply stunning fashion. Unbeaten in all seven starts over fences and the winner of 11 of his 13 career outings, it can honestly be said that the gelded son of Network has never really had a serious race over the larger obstacles and has never won by less than six lengths. His last defeat came when third to Al Ferof in the 2011 Stan James Supreme Novices Hurdle, but since switching to chasing his only real dangers have been the fences themselves. His stable companion and current champion chaser Finian’s Rainbow has barely warranted a mention in the build-up to the big race, but the fine performer (currently a 10/1 shot) could easily give Henderson a famous one-two in a race he also won in style some years back with the hugely popular Remittance Man.